Guitarist Max Schultz, together with three of his equally outstanding colleagues specially chosen for this production, pays tribute to one of his greatest inspirations, John Coltrane. The repertoire consists of ten compositions that Coltrane wrote and recorded for Atlantic and Impulse from 1959 until 1965, plus two originals by Max. I remember the first time I heard John Coltrane. It was when my mother was playing the album “A Love Supreme” and I was the age of seven or eight. I was immediately taken by the expressiveness and beauty of the music. I had not yet started playing the guitar but almost ten years later I went with my father to a jam session and in the break someone put on “Live At Birdland”. What incredible energy! I went and bought the record immediately, as well as “Giant Steps”, and tried to transcribe what I heard. “Naima” was one of the first tunes I worked on, and also “Spiral” and “Afro Blue” were tunes I learnt. When I was asked by Laila and Charles Gavatin to make a CD for Touché Music I asked myself: Who has most inspired me since I first began playing? Coltrane of course! On this CD I have tried in my own way to play what I believe I have learnt from John Coltrane, and in the company of musicians who I have long admired but with whom I have seldom had the opportunity to play. My sincere thanks to them and everyone who has made this recording possible. John Coltrane was born in 1926 in North Carolina. Lester Young and Charlie Parker were early influences but he made his debut as a professional musician in different rhythm’n’blues bands. From 1949 until 1951 he played with Dizzy Gillespie, both with his big band and later with his smaller groups with which he made his first commercial recordings. For a wider jazz public Coltrane begins to attract attention when he becomes a member of the Miles Davis Quintet in 1955. His style of playing in the beginning is controversial but he quickly develops during his years with Miles. By 1958 he has originated a very personal tonal language that in time develops even more to become stylistically influential throughout the whole jazz idiom. His way of compounding very fast and well-articulated phrases as tight groups of notes in every chord change is unique. His instrumental expression ranges from an intimately beautiful tone in ballads to intensive explosion-like waves of energy where the sound capacity of the instrument is stretched to the utmost limits. From the later half of the ’50s Coltrane’s work is richly documented in classic recordings with, above all, Miles Davis but also with, among others, Thelonious Monk. He also records many sessions for the Prestige label either in his own name or as a sideman. In 1957 he records the album Blue Trane for Blue Note, which becomes a milestone in his career and establishes him also as a distinctive composer. On 4th of May 1959 soon after making the historic Kind of Blue album with Miles Davis he records six titles in his own name for Atlantic, making what was to be another classic album in jazz, Giant Steps. One of these titles was Spiral. A seventh title, Naima, was added to the album from a later session on 2nd December of that year. Next year on 24th October 1960 Coltrane records many more titles for Atlantic that were spread over different LPs, one being Coltrane Plays The Blues. Two of his originals were Central Park West and Mr Syms, by which time he had started to play soprano sax in addition to the tenor. In the mid-’50s Coltrane was deeply involved with drugs, a habit that he succeeded in overcoming. When he leaves Miles’ band in 1960 to form his own quartet his technique is virtuosic and he also has a musical vision that he develops with uncompromising logic. Coltrane’s music now often contains noticeable religious overtones and the traditional forms and harmonic sequences of jazz, which he so fully mastered, give way for more modal structures. In 1961 Coltrane has begun to make albums for the Impulse label and After The Rain comes from a session 29th April 1963. Later that year on 8th October, he records Afro-Blue live from Birdland with his classic quartet of McCoy Tyner, Jimmy Garrison and Elvin Jones. In the summer of 1964 he records what many consider one of the most cohesive and interesting of Coltrane studio albums, Crescent. From that album come the three titles Wise One, Lonnie’s Lament and the title track Crescent. Elements of Asiatic and African music cultures become more and more prevalent in his music. Welcome was recorded by Coltrane on 28th June 1965 and represents one of his later works. At the time of his passing on 17th July 1967 Coltrane’s music has travelled through a metamorphosis from hardbop to free collective improvisation, all played with masterly instrumental control and totally convincing artistic integrity. Bringing together two thirds of EST (Berglund, Öström) plus piano legend Bobo Stenson would be interesting enough, but it gives fellow Swede Max Schultz on guitar the unenviable job of avoiding being upstaged by his own band. This he just about manages to do, and emerges as a player of fleet fingers and deft imagination. Despite being inspired by Hendrix, his tone is very much in the Charlie Christian-Tal Farlow-Barney Kessel-George Benson lineage but he carefully avoids run-on fingers that can afflict contemporary guitarists in this style, preferring a largely horizontal rather vertical approach to improvisation. Yet despite telling solos on 'Afro Blue,' 'Crescent' and 'Spiral' he chooses an orthodox approach to Coltrane's compositions with Stenson commanding our attention. A piano master, it is fascinating to here Berglund and Ostrom moonlighting on this enjoyable session. Two recent albums explore the music of John Coltrane from different angles, each one with its own level of fidelity to the canonical texts. 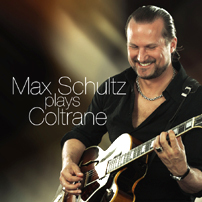 Guitarist Max Schultz applies his Santana-like chops to several Trane standards on Plays Coltrane. On Impressions trumpeter Claudio Roditi translates Coltrane into the samba idiom. It's a testament to the breadth and appeal of Coltrane's body of work that the two albums have only one song--”Naima”--in common. Schultz' ambitious original “Song for John” could serve as an overture for the album since it contains and suggests thematic and stylistic elements (eg, the four-note bass figure from “Acknowledgement”) that recall several Coltrane tunes. Plays Coltrane is generally a quartet album but there are a few departures from that format. The ballad “Central Park West” is marred slightly because Schultz and pianist Bobo Stenson initially can't quite get out of each other's way, like dancers stepping on each other's toes. They overcome their missteps, however, and their flawless simpatico on “After the Rain” leads one to clamor for an album of duets. There are no missteps, however, on the excellent bass-guitar duet on “Welcome” between Schultz and bassist Dan Berglund's full-throated, relentless arco. Roditi's tone throughout Impressions is clear as a bell and illuminates the energy of the samba rhythm on “Moment's Notice,” “Giant Steps” and the title cut. There's not a strident or wavering note played by Roditi; he blows with intelligence and clarity and is always in control. The most curious moment on the album, however, involves Roditi's inclusion of “Bye Bye Blackbird.” Trane performed his own blistering live version of the tune, but Roditi clearly references the Miles Davis version done with Trane. In ascribing this tune to Trane Roditi's compass appears to be off slightly, especially since he plays the song in Miles' style, right down to the Harmon-muted trumpet. While there are no jaw-dropping moments here, no why-didn't-someone-else-think-to-do-that-with-Trane's-music kind of inventiveness, both Impressions and Plays Coltrane are solid additions to the ever-expanding list of tributes to John Coltrane." Magnus Öström and Dan Berglund appear courtesy of Spamboolimbo Productions/ACT Records. Magnus Öström plays Zildjian Cymbals exclusively.